David Smith‘s latest app, a calendar app named CalZones that is putting the focus on facilitating the handling of events across multiple timezones, is making quite a splash these days. The app is mentioned and/or reviewed on many tech blogs and seems to receive universal praise, as far as I can see. And the praise is not unjustified. CalZones comes with some really fresh design and animation ideas, and – as mentioned before – the ability to take the friction out of handling multiple time zones in calendar events is certainly a compelling selling proposition. It does not seem as if there is a touch gesture for navigating to the current date. However, when using a hardware keyboard, the app supports the shortcut ⌘ T for this purpose. No search. This is big, a calendar app that does not support search is not going to make it on my devices. I haven‘t found any way to create a calendar entry boundary with a finer granularity than 15 Minutes. For example, you can start an event at 9:15, but 9:12 is apparently not foreseen. Such a limitation, if confirmed, is not exactly compatible with calendar entries for train or flight connections1. Despite all the complaints, I still think that Smith delivered a 1.0 that should be a solid basis for further iterations. 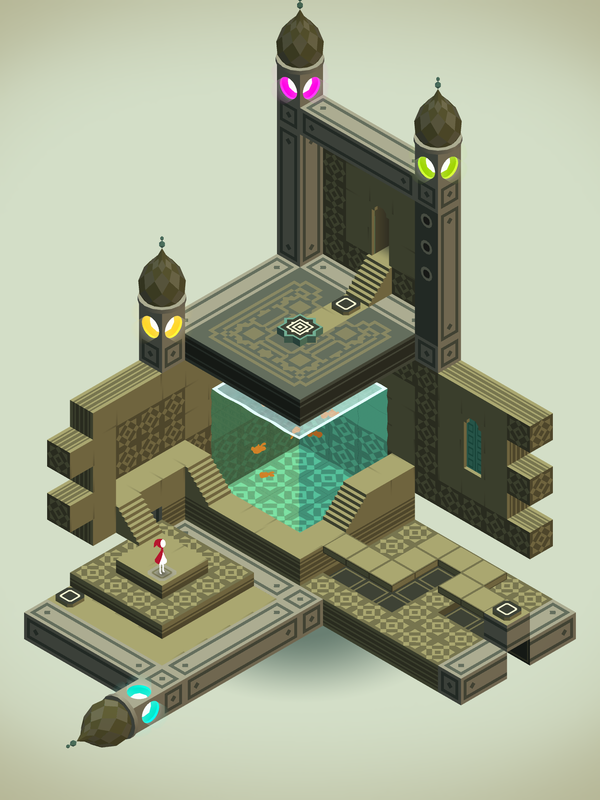 Remember Monument Valley? The game, developed by the studio ustwo games, was originally released in early 2014. In the fall of that year, I got my first iPad and (if I remember correctly) Monument Valley was the first game I‘ve downloaded onto my new device. Don‘t miss out – the party‘s over on May 1st. Whatever that means, I am already done with the ten additional levels. It was fun.